This year, documentary filmmaker Laura Poitras released what may be her most controversial project yet: Citizenfour. The film focuses on NSA hero Edward Snowden and not just what he disclosed to journalists in a Hong Kong hotel room, but more importantly why. While many people know that Snowden is now a resident of Russia, it’s less common knowledge that Poitras moved as well — to Berlin, in order to protect the source material for her documentary. There, she’s part of a growing community called the “digital exiles,” a group of expert journalists, software developers and even MI5 agents all fighting for our online freedom. All have fled to Germany because of its strict policies on digital privacy. The country’s secret service, BND, is not permitted to spy on citizens, and any attempts to curtail personal freedoms are met with staunch resistance. So who are the digital exiles? It’s hard to say, since they don’t hold weekly meetings or make obvious declarations of their whereabouts on social media. They’ve come to Berlin for a reprieve from the scrutiny of their own governments — in Poitras’ case, she was already on the NSA’s watchlist after two films examining the U.S. war on terror, and frequently pulled out of lines at airports or singled out on planes for extra questioning. Citizenfour simply ramped up the interest on government illegal activities. He points out, however, that hacker culture is strong in Germany, and many citizens were already concerned with their online freedom. 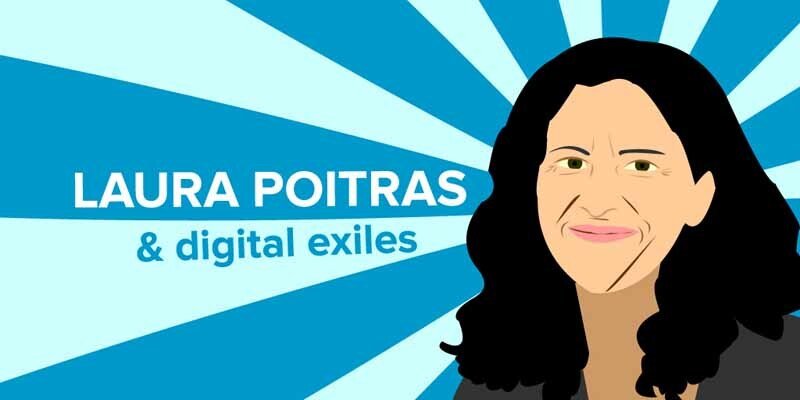 Laura Poitras and the Digital Exiles have lent the movement against government surveillance a sense of international urgency. While digital exiles aren’t looking for fame and fortune, it is possible to track some of them down. In a recent piece for The Guardian, Carole Cadwalladr had the chance to interview not just Poitras but several others including Jacob “Jake” Appelbaum and Annie Machon. Applebaum was partially responsible for the creation of the Tor network, which renders users anonymous, and also worked with WikiLeaks. Machon, meanwhile, is a former spy with British agency MI5. After the department went public in 1989 they enjoyed a period of resounding public support; however, in 1997 Machon revealed secret—and illegal—wiretaps, files held on government ministers, and the illegal incarceration of citizens. She now lives part time in Berlin and offers assistance to other whistleblowers. The exile of Laura Poitras and the digital activists to Germany is a stark reminder to us that government surveillance is very, very real. So how can we take measures to ensure our online privacy and hamper governments’ attempts at spying on us? Using a VPN to encrypt your connection is one part of the equation, but it’s only a start. Privacy is a multi-pronged approach, and for this reason, we highly recommend checking out Reset the Net’s privacy pack, which is filled with tools and information for making mass surveillance more difficult. Ultimately, we admire Laura Poitras for her tenacity and bravery, and for the great personal risk she took to create Citizenfour. We are thankful that global audiences now have access, through the film, to Edward Snowden’s revelations and motivations, and that Poitras’ efforts are making people aware about how governments infringe on our right to privacy every day.